In 2009, the National Youth Gang Center, which had been funded by OJJDP since 1995, merged with the National Gang Center (NGC), which had been funded by the Bureau of Justice Assistance since 2003. This unification signified a recognition that street gang activities transcend ages of the members and that a balanced, comprehensive approach is needed to reduce gang involvement and levels of gang crime. Consolidation of the centers has leveraged resources and resulted in a single, more efficient entity, responsive to the needs of researchers, practitioners, and the public. The National Gang Center (NGC) is a project jointly funded by the U.S. Department of Justice’s (DOJ) Office of Juvenile Justice and Delinquency Prevention (OJJDP) and the Bureau of Justice Assistance (BJA). The NGC program works to further the mission of DOJ by providing national leadership, information, training, and technical assistance that target gangs and street gang members of all ages. 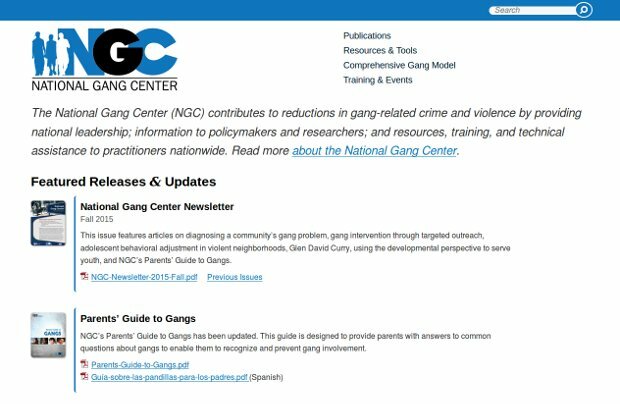 Serving researchers, policymakers, and practitioners nationally, NGC activities contribute to reductions in gang-related crime and violence and gang activity by juveniles and adults. The term “street gang” carries two specific meanings that increase its practical value. First, it suggests a common feature of gangs: They commonly have a street presence. Street socialization is a key feature of adolescent gangs. Second, this term also refers to “street crimes,” that is, serious and violent crimes (e.g., assaults, drive-by shootings, robberies, homicides) that occur on the streets and that often are of concern to citizens and policymakers. The ongoing commission of these offenses consequently instills fear among residents, undermining informal social control mechanisms within the community. How youth leave a gang is particularly instructive in understanding the gang process. Similar to the gang-joining process, desisting from gang membership is best described as gradual, taking place over an extended period of time. This is understandable, after all, since desisting from gangs involves disassociating and severing social ties with friends and/or family members who are gang-involved and may entail many attempts, both cognitively and behaviorally. Also, this process may be interrupted or entirely negated because of outside influences, such as the perception by rival gangs and/or law enforcement that the individual is still an active gang member. Importantly, although it is commonly repeated otherwise, the available evidence demonstrates that most individuals stated that they left the gang without the fear or experience of physical consequences from the gang.